Not suitable for hearing impaired. Sound ONLY Alarm. Medication Reminder Watch (12 alarms) & Medical ID (Medical Alert Data Bank) to wear on your belt loop or hook on your purse. The e-pill CADEX Carabiner is easy to program and easy to use. Once you have set your e-pill, alarms repeat automatically every day. This e-pill clip watch has an easy to read display with large text. Visit CADEX Alarm Wrist Watch Web site. Over 50,000 CADEX Watches Sold! Clip Watch. 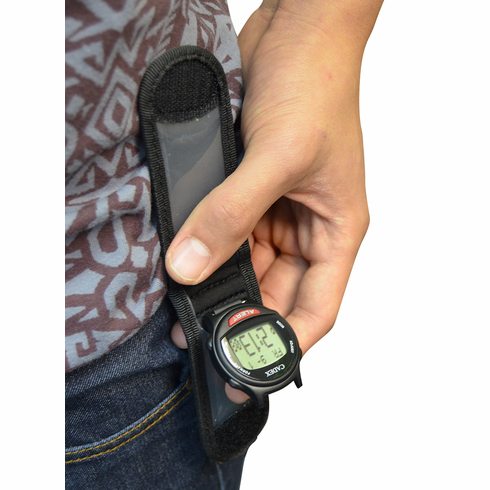 Wear it like a pager - clip it to your belt loop or purse. Wear it like a pager - clip it to your belt loop or purse. Program up to 12 medication reminders (sound only) including reminder text message (name and strength of medication or other prompts). Message scrolls across the display. Programming is done on the watch (excellent easy to understand manual). Watch VIDEO: CADEX Introduction Video | How the e-pill CADEX 12 Alarm Watch & Medical Alert was invented Video. Manufacturer: e-pill, LLC | 1-year warranty by the manufacturer.